The appellation of the most exalted and pre-eminent Thrones denotes their manifest exaltation above every grovelling inferiority, and their supermundane tendency towards higher things; and their unswerving separation from all remoteness; and their invariable and firmly-fixed settlement around the veritable Highest, with the whole force of their powers; and their receptivity of the supremely Divine approach, in the absence of all passion and earthly tendency, and their bearing God; and the ardent expansion of themselves for the Divine receptions. 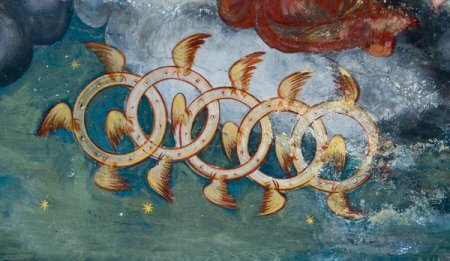 The mention of wheels links Thrones with the Hebrew Ophanim, meaning wheels, creatures made up of linked rings with eyes. Their function is to move the throne of God when required. This is shown in this rare image from the church of John the Baptist, Kratova, Macedonia. The idea of Thrones as wheels is not generally accepted in Christian theology. Rather they are seen as symbols of authority and justice, and their name does give weight to that. 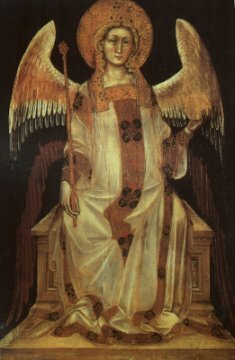 Here are two images showingThrones in a more familiar angelic form. On the left below are the Thrones from the Baptistery in Florence. 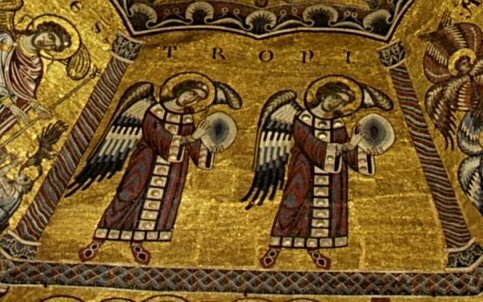 The other is by Guariento D'Arpo, c 1345, froan sequence of angelic images. The Florentine Thrones carry mandorlas, which have a suggestion of wheels. Guariento's Throne sits on a throne rather than carrying one, and this certainly suggests authority and justice.